Choruses of spring peepers have risen from the woods. But how did those inch-long amphibians deal with the vagaries of New England weather that can swing temperatures from the 70s to the 20s in April? To peepers, a sudden freeze or even a spring snowstorm is no sweat. Cold air triggers the frog's liver to create glucose. Blood brings this antifreeze to the vital organs like the brain and heart, keeping them from freezing. But the rest of its body — more than 60% of it — can freeze for weeks without harming the frog. 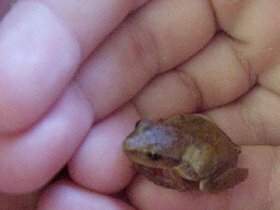 So on a walk in a wood on a cold spring day, you may find a small, frozen frog. If you put it in your warm hand, the iced peeper will simply melt and hop away, no doubt with a song in its heart.